I don’t know how it is for you, but I’m usually pretty bored with my winter wardrobe by this time of year and am looking for ways to punch things up a little. So it’s a great time of year for Spring Closet Organization and that also presents a great opportunity to sort out your seasonal wardrobe and store your winter clothes away until next season. So once you’ve got your closet organization handled and have laid away your winter clothes, it’s a fun time to look around for some affordable and simple accessories to help add update and add some interest to last years Spring Wardrobe and without breaking your budget. 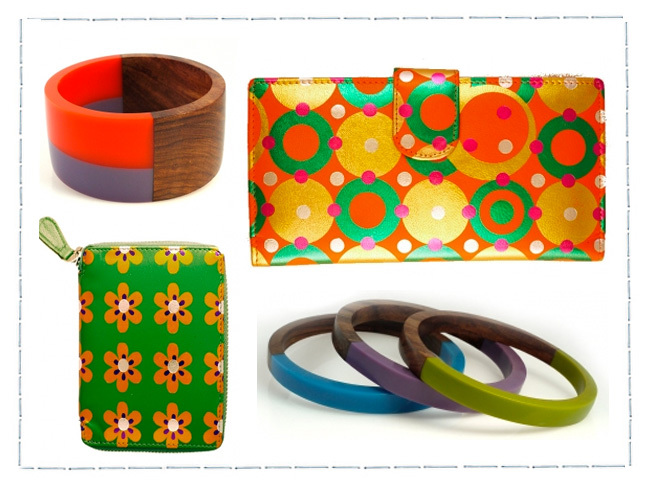 I was immediately attracted to the graphically appealing contrast of this hardwood and resin Orange & Lavender bracelet that is not only well priced, but is sure to update and add style to almost any piece in your Spring wardrobe. 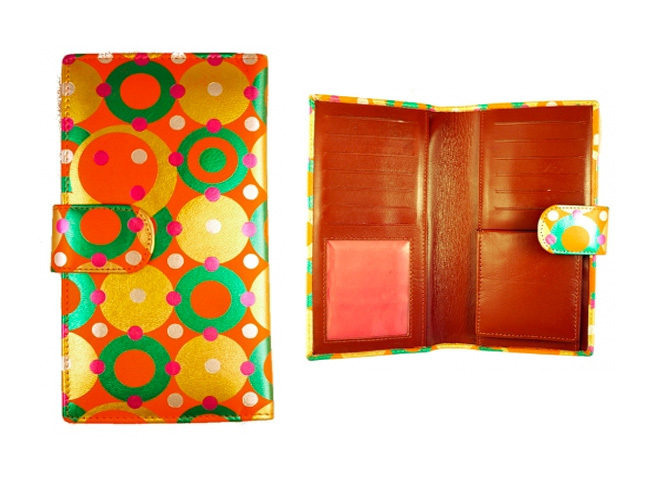 And every mom should have a brightly colored wallet that makes it easy to find in the bottom of her purse. So when I came across this cheerful orange leather wallet, that’s also beautifully accented with metallic foil printing, I just had to share it with you. Plus when you open it up, the inside features a classic burgundy interior that safely stows away 12 credit cards and also has a nifty coin pocket to store away some meter money too. This 3 piece bracelet set, featuring moss, lavender and blue resin accented against the natural beauty of hardwood, is not only fun to wear, but it would also make a great gift for a loved one. The graphic look of these brightly colored flowers on this Green Leather Wallet gives a nod to the Flower Power phase of the late 1960’s and early 1970’s. And even more fun are it’s compact size and easy zip closure that are sure to make it one of your favorite takealongs. Plus, it’s cheerful sky blue lining is sure to bring a smile to your face every time you zip it open. Jenna Dewan Says Parenting Will Be An Adventure; Dishes On Marriage To Channing TatumPhotos: Celebrity Parents And Kids – Heidi Klum, Holly Madison and More!